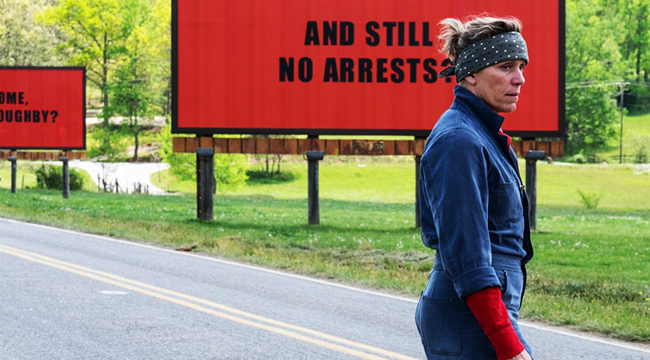 Three Billboards Outside Ebbing, Missouri premiered on a Monday night at a small, out-of-the-way theater on a side street at September’s Toronto International Film Festival. Nine times out of ten, this is code for “The movie you’re about to watch will quietly wither away in the real world and is therefore unworthy of an A-list red carpet extravaganza.” Then a funny thing happened to this darkly funny movie: It killed. The cast got a rare standing ovation. It won a well-deserved Audience Award. Now the ultra-original film with the pitch-perfect cast and cumbersome title is primed for Oscar nominations galore. Go. Frances McDormand plays Mildred Hayes, a single mom living in the small hick sticks of Missouri. (I can say this, I think, because I am a proud University of Missouri graduate.) It’s a place where everybody knows your name. Seven months earlier, her teen daughter was raped, set on fire and killed while walking to a party. Local chief sheriff Bill Willoughby (Woody Harrelson) has zero leads. Frustrated by the lack of traction, Mildred pays to advertise on three billboards near the site of the murder. The ads are public reminders of the heinous crime, and she personally blasts the sheriff for not making an arrest. The action and public shaming infuriates the local police office — especially a hot-headed, blatantly bigoted officer (Sam Rockwell). It’s important to note that McDormand isn’t a tragic heroine, and Harrelson isn’t a steely villain. They’re both smart, caring, stubborn, wildly flawed people that actually like each other. This is one of many impressive instances in which writer-director Martin McDonagh subverts expectations. Their dynamic rivets: When Bill asks Mildred why used his name on the billboard, she admits it’s because he’s the guy in charge. It’s not personal. Bill also isn’t as hard-charging as he appears. He’s dying of cancer — and the sicker he gets, the more the locals (and media) turn on Mildred. Not that she cares. This is McDormand’s best work since 1996’s Fargo. She owns every scene, displaying a mix of fierceness and vulnerability. She’s unafraid to knee a high school student in the groin because he throws a drink the windshield of her car. She tells off a priest. And yet she also shows her softer side talking an innocent deer. She doesn’t want eye-for-an-eye vengeance — she wants justice. I just wish she weren’t so inherently mean-spirited. I cringed at the way she treated the kind-hearted “town midget” (Peter Dinklage). I think their scenes were played for laughs. I didn’t laugh. She’s dismissive of her teen son’s bullying. She also commits a crime that’s shocking in its rage. There are no repercussions for it. Mildred wasn’t exaggerating about the town’s lackadaisical approach in arresting criminals. I also need to mention Rockwell, i.e., your Best Supporting Actor Oscar frontrunner. He’s a yokel that lives with his racist mama and thinks nothing of throwing a man out the window. You will hate him. But just when you think you’ve got this guy pegged, you haven’t. Trust me on this. It’s one of the most surprising and trickiest characters I’ve seen in a long while. I admit, I thought Rockwell was past his prime as a hot actor (I don’t mean in the handsome sense.) But this role, at long last, lives up the potential he showed way way back in 2002’s Confessions of a Dangerous Mind. (And, on that note, The Way Way Back in 2013.) He’s a damn revelation. The commercials for Three Billboards amuse me for the wrong reasons. “From the writer-director of In Bruges and Seven Psychopaths….” Did more than seven people in total see either fringe film? This is not a selling point. I’ve seen both and can’t remember a single scene. I never thought McDonagh, a British-Irish playwright, had this kind of master work in him. The sublime dialogue never gets in the way of the storytelling. He lets his narrative build in inventive ways, and lets each scene breathe. You’ll have to see it twice just to appreciate it. No, Three Billboards isn’t a 48 Hours-like crime mystery in which we’re on the hunt for a murderer. It’s not a revenge fantasy either. We just want a little bit of peace and hope. You’ll find it here in the most profound of ways. Three cheers. « Mel Gibson and Kevin Spacey: What To Do When Bad Guys Make Good Movies?